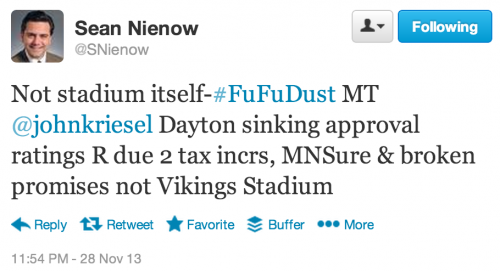 A MN GOP group called something like the MN Corporate Welfare Coalition* is going after Governor Dayton on the day of the groundbreaking on the new Vikings stadium with a blog post titled: “Mark Dayton Fumbles on the Vikings Stadium Deal“. It’s almost as if the MN Jobs Coalition has forgotten who controlled the MN House & Senate in 2012. Does the MN Jobs Coalition know the party affiliations of Rep Lanning and Sen Rosen? 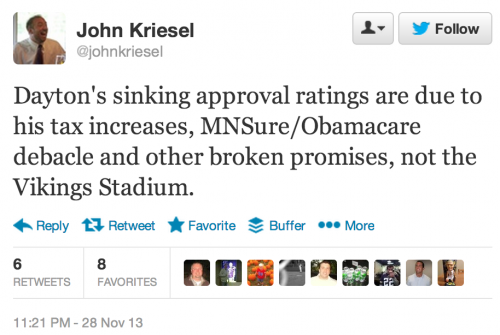 The MN GOP authored Vikings stadium bill in the MN House and the MN GOP authored Vikings stadium bill in the MN Senate were indeed disasters. 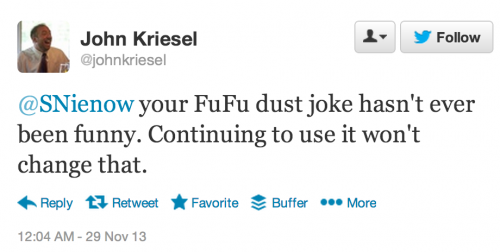 Can you believe that MN GOP Rep. John Kriesel’s gambling exploitation through e-pulltabs bill was used as the funding source? I testified at the Commerce Committee hearing about the pending e-pulltabs disaster, but the MN GOP majority committee passed along the highly questionable MN GOP authored financing scheme. 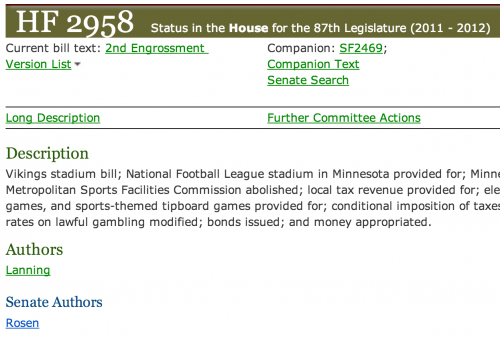 Why the heck did MN GOP Vikings stadium bill authors, Rep Manning (GOP) and Sen Rosen (GOP) agree to such ridiculousness? 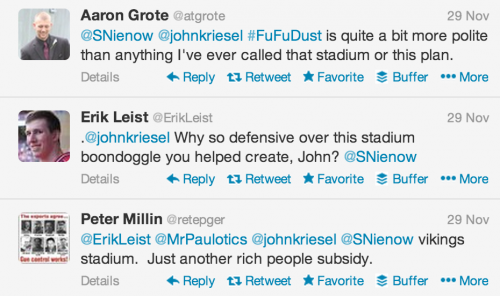 As Nienow explained to Kriesel, it never was about whether folks wanted a new stadium. It was about who should pay for it, and how, and – should the public would put money in – is the funding source reliable? 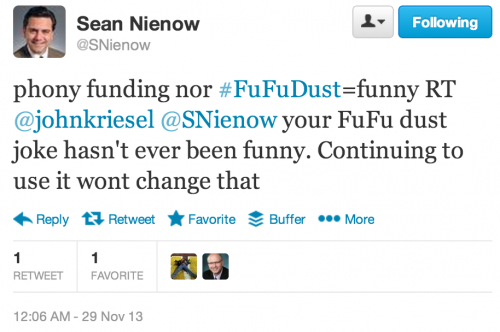 Notice that this is a case of MN GOP folks attacking the MN GOP author of a MN GOP financing scheme for a MN GOP authored corporate welfare bill. I can see why they’d rather blame Dayton for the financing mess, but Dayton didn’t write the bills, hold the committee hearings, or have a vote in the MN GOP controlled house or senate. Note that this video is hosted on the MN GOP’s official YouTube channel. As in, they’re proudly touting the financial disaster they created. * I think their mission is to create minimum wage jobs with no healthcare on behalf of publicly subsidized corporations who support MN GOP candidates. But the strongest ties belong to Dayton, which is why the blame falls most on his shoulders. This was the first issue he was able to go into the Legislature and win votes for; he made it the policy and political centerpiece of his second year in office. When people questioned his financing plan, he lashed out and had his administration insist he was correct. (Oops.) He led the cheers publicly at the start and the finish with rallies at the Mall of America and the Capitol for the bill signing; he brought Vikings stars to the Capitol. He went all in to get it and he got it. When he’s running for re-election next year, you can bet he will mention the thousands of jobs he created by signing it. It’s his baby all the way, not the DFL’s and not the GOP’s. @Kevin, I mostly find it interesting how quickly the MN GOP has forgotten that they held the majority in both the house and senate. I realize that they may not have been used to that position, but it’s hard to argue that they got bulldozed by something they could have kept from ever seeing a vote. While Dayton was out front at the rallies, he was flanked by the GOP’s corporate welfare advocates. There’s no doubt in my mind that DFL votes were earned through promises for even more wasteful pro sports construction projects for St Paul (Saints, Wild) to provide some balance to the waste with Minneapolis’ Vikings and Timberwolves handouts. But, again, that earned DFL votes rather, not GOP.